This 2013 1 oz Silver Somalian African Elephant coin from the African Wildlife Coin Series appeals to coin collectors around the world for its depiction of one of the most fascinating animals found in Africa: the elephant. With a design that changes yearly, adding instant collectibility and interest, each coin contains .999 fine Silver. Struck at the Bavarian State Mint in Munich, Germany, these 2013 Silver Somalia African Elephant coins are a legal tender in Somalia and are valued at 100 Shillings. 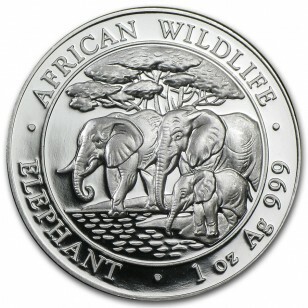 Possibly searching for food, a family of Somalian African Elephants are featured on the reverse along with the weight and purity of this Silver coin. 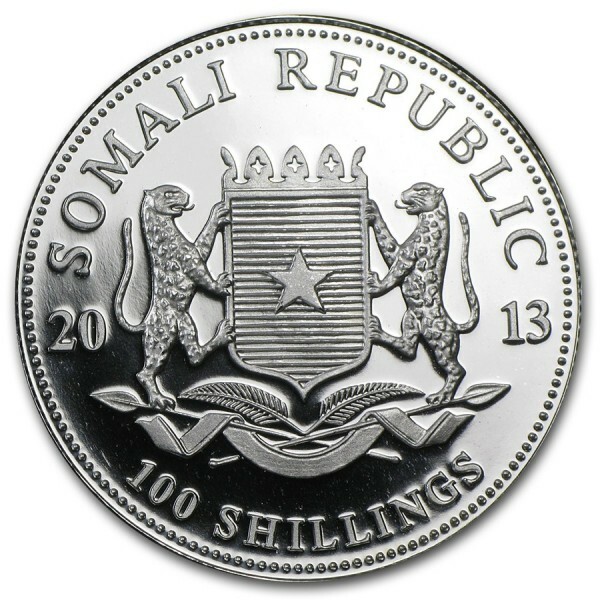 The obverse bears the heraldic symbol of the Somalian Republic, year of mintage and monetary value. Important Note: Some coins may have minor "milk spots" from the mint.